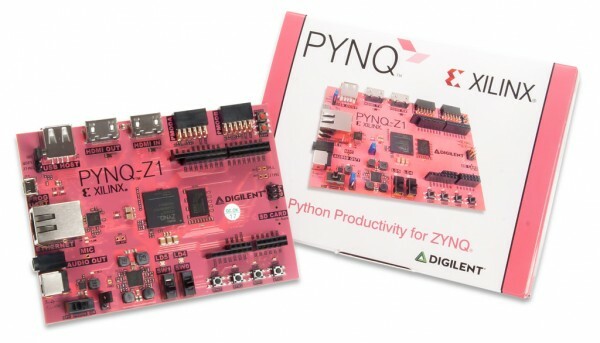 Product information "PYNQ-Z1 Python Productivity for Zynq"
The PYNQ-Z1 board is designed to be used with PYNQ, a new open-source framework that enables embedded programmers to exploit the capabilities of Xilinx Zynq All Programmable SoCs (APSoCs) without having to design programmable logic circuits. Instead, the APSoC is programmed using Python and the code is developed and tested directly on the PYNQ-Z1. The programmable logic circuits are imported as hardware libraries and programmed through their APIs in essentially the same way that the software libraries are imported and programmed. To use the PYNQ framework - it's required to have the PYNQ-Z1 boot image, which is available from the PYNQ-Z1 Resource Center. You can download the PYNQ-Z1 image and copy it to a microSD card. What can you do with the PYNQ-Z1? The PYNQ-Z1 natively supports multi-media applications with on-board audio and video interfaces. It is designed to be easily extensible with Pmod, Arduino, and Grove peripherals, as well as general purpose IO pins. The PYNQ-Z1 board can be also expanded with USB peripherals including WiFi, Bluetooth, and Webcams. This board does not include a Micro USB and Ethernet Cable, which is required for use with the board. Related links to "PYNQ-Z1 Python Productivity for Zynq"